Blogging Beautifully: Alfie & Elarna's Easter Box 2018! 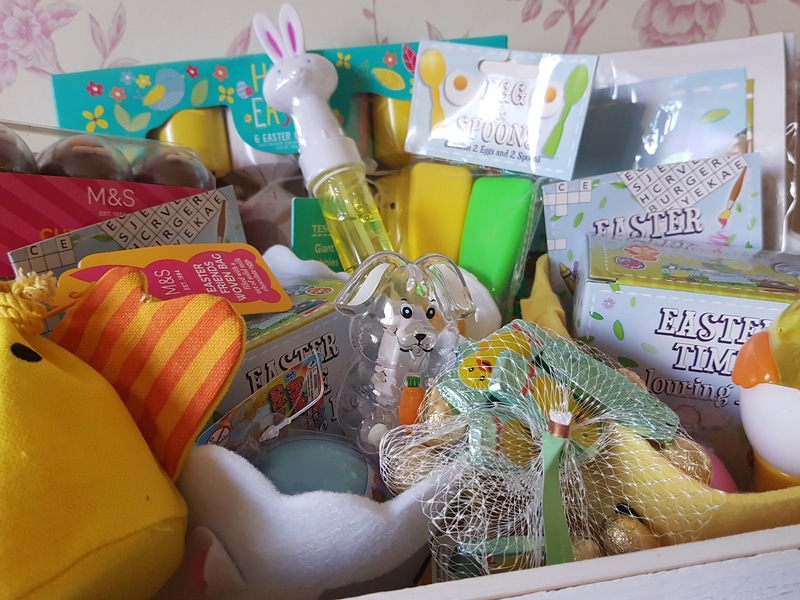 Alfie & Elarna's Easter Box 2018! I do love a themed boxes for occasions like Easter and Christmas. They don't take long to put together, don't have to be overly expensive and can be a nice little treat for the children on Good Friday. This year I have to admit I've put this box together quite late and I've winged it a bit but I think that I've managed to fill it with lots of nice bits and pieces that I know my 2 will love. So, I thought i'd write a quick post with what I've included, everything in the box is either from supermarkets such as Tesco and Waitrose and then Party Pieces online, these are all items I've purchased myself. I used this lovely, lightweight rustic box this year instead of a basket (purely because they all have toys in them!) and I packed it with bubblewrap and put some yellow tissue paper on the top bulk it out a bit. In any of the themed boxes I create I tend to make sure there are plenty of things to 'do' included rather than a ton of sweets and things like that. I know exactly what my kids will like so I included a mix of crafty and fun bits this year. I have listed below what I've included. First up a couple of lovely easter mugs that they colour the insert themselves, they will both love colouring them in and using them. 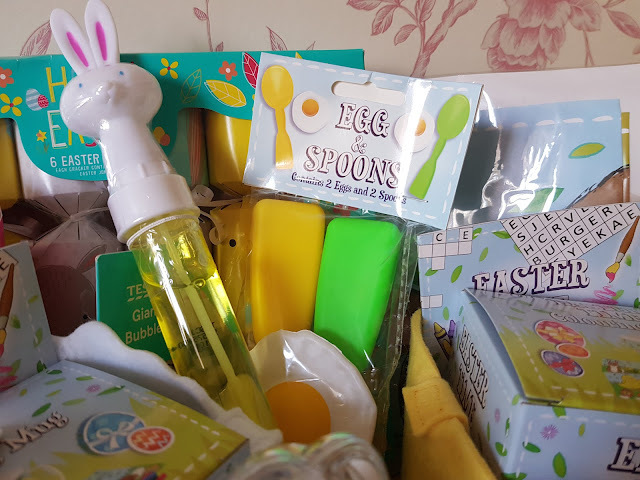 An egg and spoon race, this was cheap as chips from Party Pieces figured it was fitting for Easter, they will love it - although judging by the weather forecast may need to be an indoor race, fun! Pin the tail on the bunny game, always a winner and again was a bargain price, I couldn't resist. A couple of Easter puzzle backs, these are always well received and will hopefully offer a little bit of entertainment......for maybe 10 minutes haha. Easter crackers! I find that crackers of any sort bring smiles and I spotted these in Tesco the other day for just £3.00 and thought they would make a nice addition to the box. Giant bubbles! Kind of regretting these a bit now as the weather isn't supposed to be great over the Easter weekend and I don't fancy the idea of using them in the house but if we don't get a chance to this weekend I'll just keep them to the side for when the weather is better. A couple of eggs with grow your own chicks inside, I assume that you put them in water and they grow. Alfie seems to love these (no idea why) so I'm sure these will be well received. Some really cute little felt baskets to collect their eggs in. I was looking for some nice baskets but couldn't seem to find any so thought these from Waitrose would be perfect, they are really cute and were £3.00 each. Finally, of course I have included some chocolate, I couldn't not put any sweet stuff in at all. I added some gorgeous chocolate egg chicks and a little Easter friend woven bag with choccie eggs in them (from M&S) and some very cute little foil wrapped shapes from the Co-op. 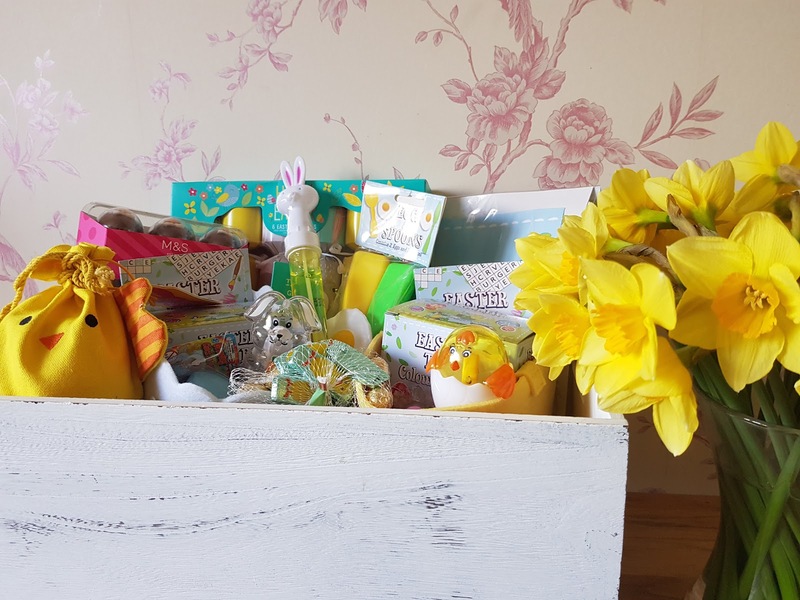 So this is my 2018 Easter box, I would love to know your thoughts! Happy Easter all, have a wonderful long weekend. Smoke and Fire - A Year On.